about 40 Thieves - Irish music in your rock and roll? Rock in your Irish music? Washington, D.C.'s 40 Thieves fuses the best of both. Check out our new CD Ceol DC! Visit our Official Blog!and MySpace. Any thoughts, requests, demands, comments, complaints, manifestos, Joycian-stream-of-consciousness ramblings? Air it out on our blogsite...but please try to be respectful of women and children, and don't threaten any heads of state. 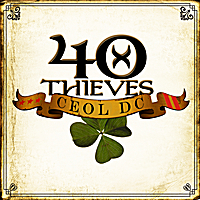 40 Thieves have established themselves as one of the best loved Irish bands in the Metro DC area. 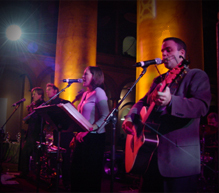 From the cozy confines of the DC areaï¿½s best Irish pubs to the wide-open stages of the festival circuit, this rocking ensemble has wowed the crowds by wedding old fashioned and newfangled Irish music with straight ahead rock and roll. Vocalist Melanie Caudron's rich, mellow croon meshes beautifully with guitarist Dave Dresser's gritty rock yawp. Fiddler Randy Latimer's classically honed, Cape Breton-influenced chops filigree the bar-band stomp and Guinness inspired grooves provided by drummer Jim Sullivan and bassist Charlie McNamara. Multi-faceted? No doubt. Come see us again! To hear 40 Thieves, go to CDBaby.com where you can find sound clips from our first CD. Or download free mp3 song files of our entire cd.